While molecular gastronomy is at the cutting edge of food technology, sushi remains the state of the art. Directed by David Gelb, "Jiro Dreams of Sushi" is the story of 85 year-old Jiro Ono, considered to be the world's greatest sushi chef. His non-descript 10-seat sushi bar in Tokyo's Ginza subway station is the only sushi restaurant in the world to be awarded 3 Michelin stars. Reservations at Sukiyabashi Jiro must be made at least a month in advance, with some patrons having made reservations the year before. Jiro serves only sushi. There are no appetizers or desserts. He doesn't like the idea of guests filling up on other food and ending up having only three pieces of sushi. We were astonished to see just how much preparation went into producing the deceptively simple morsels. It all starts with the best and freshest ingredients from vendors that specialize only in that particular item, say tuna or shrimp, and ends with a 20-item, 15-minute meal for a price starting at 30,000 Yen (approx. 350 Cdn.) That's easily the priciest meal in the world if you're counting by the minute... and it's in a subway station! He is really finicky with going above and beyond, such as when he massages an octopus for 40 minutes instead of the usual 30. I know, 30 seems excessive already. I didn't even know they did that. He also has procedures for keeping his rice at body temperature. Jiro is such a perfectionist that it took an apprentice 200 attempts at making egg sushi before Jiro was satisfied and called him a Shokunin (artisan). I think the distillation of expertise used in making his sushi is like building a car. Let me illustrate that point. Again, it starts with the best ingredients. Fishermen bring fish to the auction, where Jiro's regular fishmongers pick only the very best. As his tuna vendor would say, "if there are only ten fish, there could be only one best, and I'll buy that one." The fishmonger can now sell Jiro the choicest cuts of the choicest fish. Jiro considers himself a sushi chef and not even close to as knowledgable as his suppliers in sussing out the best and freshest ingredients. His job is to bring out the best in the seafood and deliver that essence to his diners. Car companies don't really make most of the car, they only do final assembly and marketing of sub-assemblies made by the likes of Magna and Delphi, which in turn have other suppliers down the line making more basic components. Come to think of it, Apple doesn't make iPhones either. They're assembled by a Taiwanese company called Foxconn in China, with parts made by Samsung of Korea and Elpida of Japan... but I digress. Jiro says after years of working hard and passing on the expertise to his son and staff, by the time the sushi gets to him it's already 95% done. The quality and skill resides in the chain, and that's the point I was getting at. There are funny moments in the movie, like when Jiro's sons were kids and couldn't afford to buy Coke. They finally were able to buy one and.... I won't spoil that part of the movie. There are also serious lessons to be had, like hard work, pursuit of excellence, and satisfaction with your station in life no matter what your vocation may be. The movie mentions that it takes 10 years for Jiro's apprentices to master their craft. That reminded me of Malcolm Gladwell's 10,000 hour rule from his book Outliers, that it takes 10,000 hours or around 10 years to attain mastery of one's domain. The best part of the movie is just gawking at all the delicious pieces of food art, and thinking one day maybe I'll find such umami elegance in my mouth, and asking questions like: Why do they looks so perfect? Why does the tuna look translucent? Why isn't Jiro making sushi in Toronto? 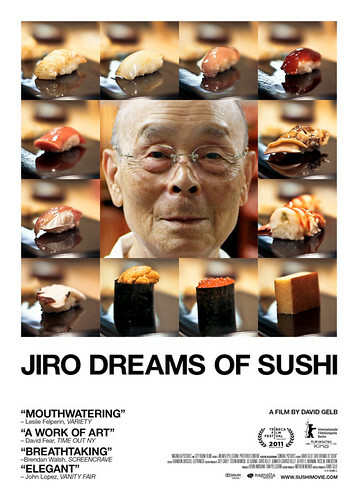 Jiro Dreams of Sushi is a surprisingly good movie, being both informative and entertaining. The singleminded pursuit of perfection and diligence in his calling seems like such an honourable path to follow were it not for the sacrifices it inflicts on one's self and those around him. Nonetheless, the existence of people like Jiro make life much more interesting for the rest of us.